On the 6th April 2010, Gordon Brown, the British Prime Minister, announced a general election, to be held on the 6th May. Six days later, on April 12th, the Parliament was dissolved and the election campaign began. Brown and his Labour Party are looking to secure their fourth consecutive term in office. The Conservative Party, led by David Cameron are seeking to replace Labour as the governing party. Up until a few weeks ago, the Liberal Democrats, and their leader Nick Clegg were not considered a threat to either party. However, a lot has changed in those few weeks. For the first time since 1979, none of the three main party leaders has headed a previous general election campaign. For the first time at a British election, the three main party leaders are engaging in a series of three televised debates, modelled on the debates held in U.S. Presidential elections. How much of an effect are these much publicised, and much talked about debates having on the media coverage for Labour, Conservatives and Liberal Democrats and their leaders? How are the media, in the UK, and across the globe, covering the various parties? And which leader is winning the battle for the headlines? O’Leary Analytics has examined the online media coverage in over 12,700 UK Publications and 121,000 Global Publications and now looks at the trends emerging ahead of the third and final televised debate. Since the start of the year, media coverage of the various parties in relation to the forthcoming general election, has steadily increased. The line graph below illustrates this trend. In the week of April 6th, when the election was formally announced, a dramatic increase in coverage for all three parties can be seen. 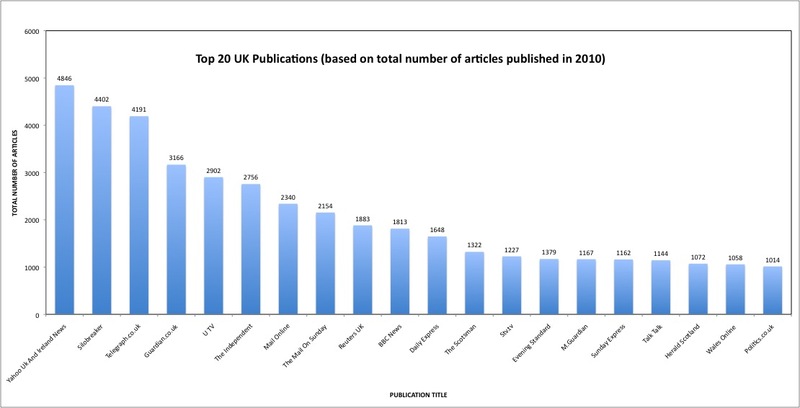 The line graph below is based on UK publications. The criteria for the search was any article which mentioned the political party and the word “election”, “elected”, “electorate”, etc. The analysis illustrates that Labour have held the lead in the media stakes since the start of the year, followed closely by the Conservatives. The Liberal Democrats have been a distant third for most of the year. The coverage for each party is very much in line with the coverage of their respective leaders. Gordon Brown has grabbed more than half of all the headlines this year in relation to the election. David Cameron is again second with just over 30% while Liberal Democrat leader, Nick Clegg, is third. 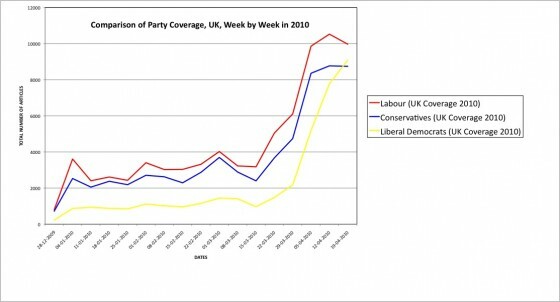 Since the 6th April, when the election was announced, the media coverage has changed dramatically. That the volume has increased is of little surprise – in the UK it set to dominate the column inches up until the result is announced. 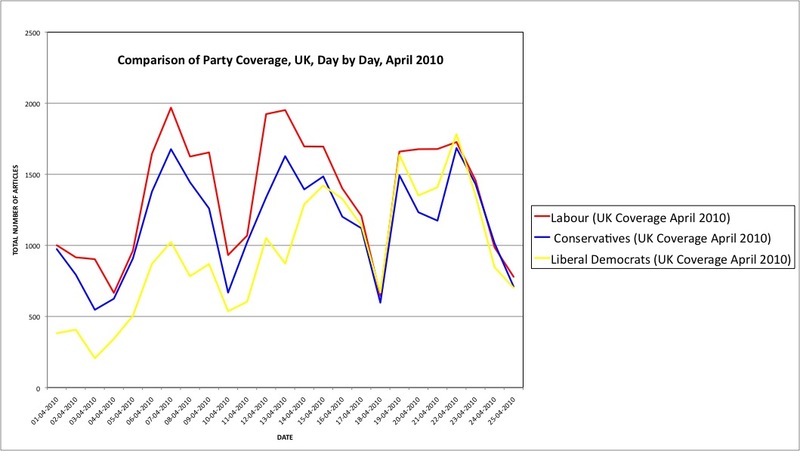 However, each party, and their leaders, has also seen major changes in their own coverage. On April 1st, Labour and the Conservatives were neck and neck in the media race. The Liberal Democrats were a distant third with less than half the coverage of their major rivals. By April 15th, the Lib Dems had closed the gap on the Conservatives, with Labour now in a clear lead. Over the past 10 days, the Liberal Democrats have surged past the Conservatives, and at one point, on April 22nd, they were the leading party in terms of media coverage. The daily breakdown becomes more compelling when we look at the coverage of the individual party leaders. Much has been made of the live televised debates, and from a media standpoint, they have had a massive effect. The line graph below covers the same time period as the one above, but in this case, it illustrates the coverage each leader has enjoyed in relation to the election. 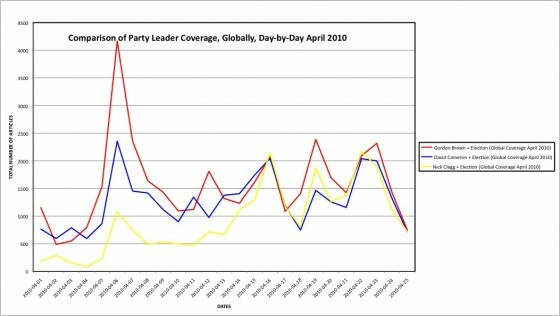 The spikes in coverage clearly demonstrate the impact of the debates, and the gains and losses felt by each leader. 6th April: The announcement. All three leaders saw a spike in their coverage. Nick Clegg was mentioned in just over 1,000 articles, David Cameron in almost 2,500 articles, and Gordon Brown, as the current Prime Minister was mentioned in over 4,000 articles. 16th April: Just 10 days later, a dramatic shift in power had emerged. 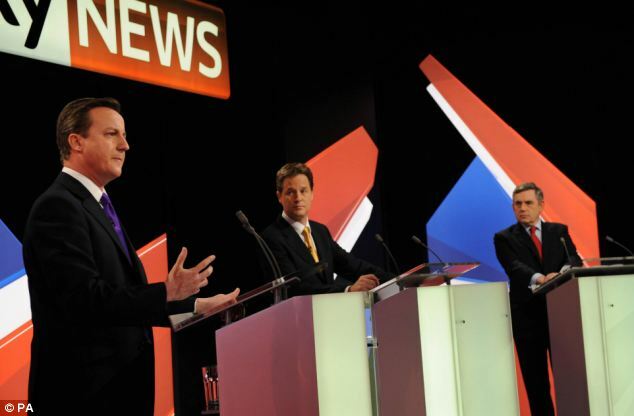 This was the day following the first televised debate between the three leaders. 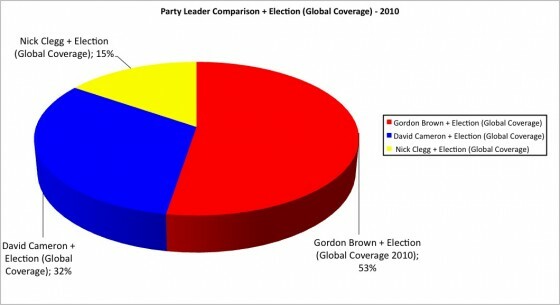 While Brown and Cameron remained constant in their coverage, it was Nick Clegg who gained the most, following a strong performance. For the first time in 2010, his name was mentioned in more articles across the globe than either of his rivals. 19th April: At this point, it was clear Cameron had been the major loser in the first debate – his mentions were down significantly as Brown maintained his coverage and Clegg continued to increase his. 22nd April: The day of the of the second debate. Despite not having been declared “the winner” of the second debate, it was Clegg who again captured more column inches than either Brown and Cameron. For the second time in a week, he beat both his rivals in the media battle. O’Leary Analytics has identified the top 20 UK online titles based on their coverage of the parties and the election. Yahoo! UK and Ireland News leads the way with almost 5,000 articles in 2010 to date, a number that will continue to rise over the next few weeks. Silobreaker, a leading news aggregation website is second, while three “traditional” media sources (albeit their online editions) – The Telegraph, The Guardian and UTV – make up the rest of the Top 5. On Thursday, 29th April 2010, the final televised debate will take place. A week later on May 6th, the polls will open and the UK will elect a new government and with it, a new Prime Minister. What began as a two-horse race between Cameron and Brown, Conservatives and Labour, has quickly turned into a three-way battle with a Liberal Democrat role in Government a real possibility. It will be interesting to watch the online media coverage of the election grow over the next two weeks. Broadcasters in the UK are required to give equal coverage to each party as part of their broadcasting license. This doesn’t apply in print – British newspapers explicitly endorse particular parties and candidates. Nor does this requirement extend to online news sources. However, from the research above, it has become clear that at this stage, very little separates the parties or their leaders in the way of coverage online. Is it possible that that the broadcast sensibilities have infused online reportage or simply a case of a too-close-to-call three way race?